Platinum's classic line is made up of six different iron gall inks, all of which start as a lighter color, and get darker with time. 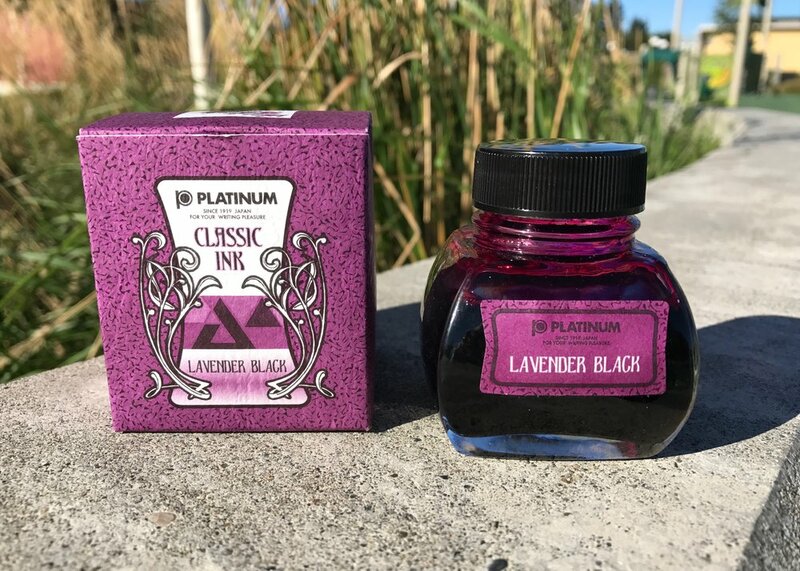 Today's Platinum ink is Lavender Black. I got my bottle of ink from Pen Chalet. 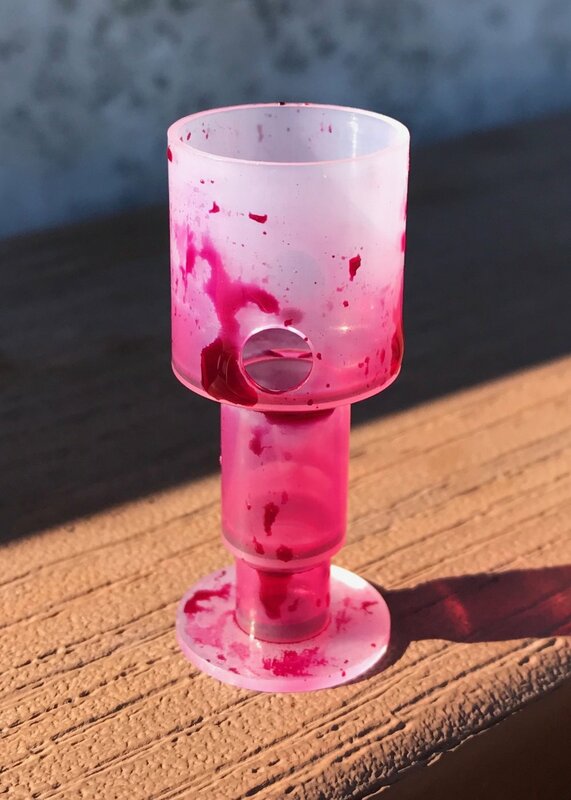 I've always been a bit chicken about iron gall inks, but this ink has sold me on them. You do need to be mindful about how often you clean your pens with iron gall ink, so just don't leave the ink in a pen for too long. In the near future I will do a post about iron gall inks after I have had a chance to play with more of them. 60 ml of ink. the bottle does come with a plastic ink miser in it. It's taller than the Sailor inserts, so I gave it a try-and my pen got stuck in it. So I had to pull it out to save my pen, I will not be putting it back in the bottle. 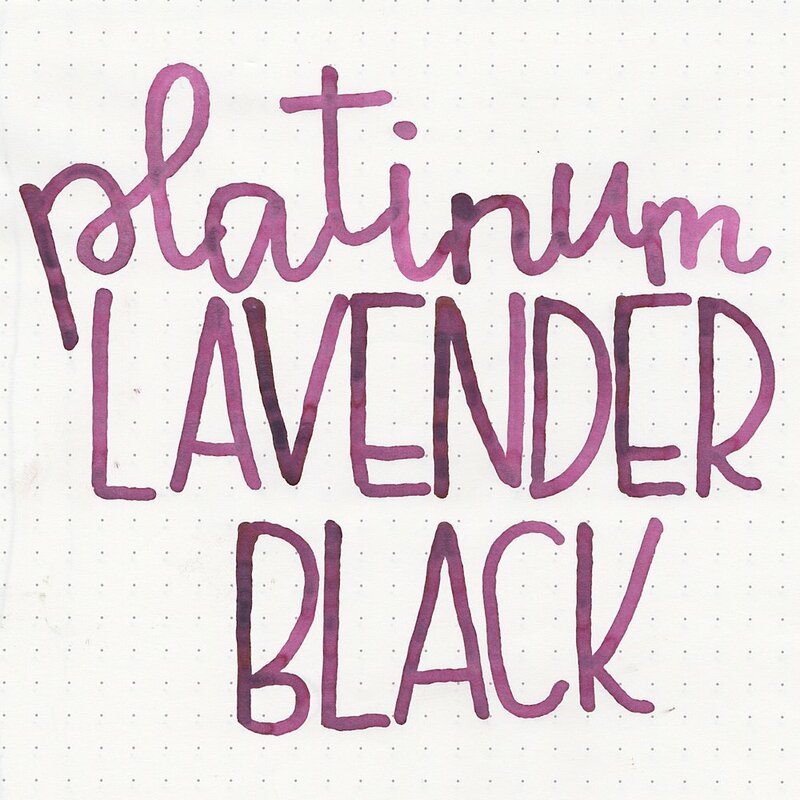 Lavender Black starts out as a medium pink and dries to a medium purple. Seasonally, I would use this ink in the fall. When the pooled ink dries, it almost looks black, with a velvety texture. Water resistance: the purple washes away, but the black undertone stays, so I'm gonna say medium water resistance. Ink swabs for comparison, left to right (top to bottom for RSS): Diamine Tyrian Purple, Platinum Lavender Black, and Montblanc Antoine de Saint-exupery. To see the Platinum ink swabs together, click here. Antoine de Saint-Exupery is more red than Lavender Black. Diamine Music Handel, Pelikan Edelstein Amethyst, and J. Herben Larmes de Cassis. To see the purple ink swabs together, click here. Overall, I love that the ink changes color-it's a bit fascinating to watch. This is the first ink that I have reviewed that showed high shading. I'm obsessed with shading at the moment, so that makes me happy. I'm glad I have a full bottle of this one, because I really love it.